Christian Love and Fellowship | Still Black. Still Reformed. Still Around. The Regular Reformed Guys had me on as a guest for Episode 16. What else did we talk about ? Race, Ethnicity, Unity and the Gospel of course. Great guys. Allan remembered me from an IRC channel (#prosapologian as a matter of fact) a buncha years ago. Good discussion between us. A bit of hilarity in-between as well. Just an observation:While Rich’s interaction with you deserves observation and comment, I think it’s a separate issue to what James said. Conflating the two mistakes Rich for James. They may work together but Rich goes to a different church and often has differing opinions than Dr. White. You were blocked by Rich. And I think that does need addressing. Fair enough. I was actually blocked by both (found out that Rich controls twitter feed for both). For the reader: while I address both men in this post, be mindful of when I’m addressing one or the other. While I believe (per my observation of their postings) that both are in agreement on this topic, I could be wrong. I thought I did a good job of separating the two, but may not have done so well enough. Feedback welcome. The Sovereignty of God is a funny thing to watch play out, especially when you’re in the middle of it. So I decide to jump back into blogging/online discussions and interactions. I’ve literally been out of the way since about 2010 because BlackCalvinist needed to sit down, chill out and rest for a bit. 2005-2010 BlackCalvinist had a reputation for being very biblically accurate and occasionally very harsh and non-loving in his presentation. Some of that reputation is justified; I’ve been known to degenerate a conversation to talking about my opponent’s mother being so fat she’s on both sides of the family. The snark and sarcasm ran deep with me (and still does to a degree). Fast-forward to 2016. My wife has mellowed me out. My church has done the same. I’ve spent a lot of time over the past six years away from the internet – occasional discussions on FB and a few videos here and there, but generally nothing consistent. Life Doctrine Music has eTumbleweeds rolling through it and TCDC only has had 3-4 significant posts since 2010. Long story short: no internet issues or drama. None. And I’m trying to keep it that way. Recently, James R. White, who I’ve repeatedly said (even to him) is my favorite author , has been under fire for some comments he made about a young black teen he caught on his dash cam flipping off the police and littering. Those comments were deleted shortly afterward, but the internet never forgets. I will come back to this post in a bit as the basis of White’s argumentation is found here. Since then, RAAN and Reformed Margins have released additional blogposts talking directly to the issues involved. The rest of the reformed world is noticing as well. The article by Marcus Ortega was shared by a friend of mine and I then decided to share it on my timeline. I agreed – the good doctor did indeed miss a good opportunity to dialogue and communicate more effectively. I’m used to seeing Doc engage those on the other side of a discussion with him, so this was very VERY out of character. I’d been warned by a few people that he’d been rebuffing brothers in Christ who approached him to discuss the issue (some were willing to fly out and talk with him in person). A little background is in order: I came to know the works of Dr. White back in the late 90’s starting with The King James Only Controversy. Many of his other works including The Roman Catholic Controversy, Mary: Another Redeemer and The Mormon Controversy, have all benefited me much in ministry over the years. The Potter’s Freedom is actually the book (alongside of Arthur Custance’s “The Sovereignty of Grace”) that helped me to understand and see the biblical basis for the doctrines of grace back in December of 2000. I actually had a small stint as an op in his IRC channel, #prosapologian in the early 2000’s (some of you might remember me as OS_X or Xarminian). I’ve interacted with Doc, watched him interact with others over time and always appreciated the way he would actually interact with his opponents (especially Catholic apologist Dave Armstrong). So with all of that said, I’m not some random trouble maker (or any kind of trouble maker for that matter). Back to the present. 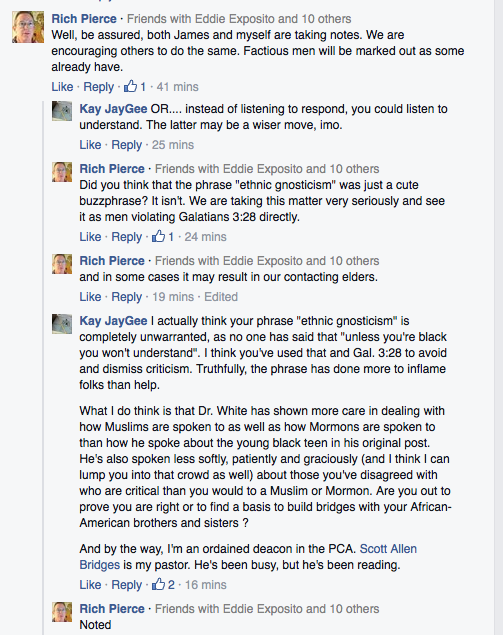 We share multiple friends in common, so Rich Pierce (president of Alpha and Omega Ministries) pops in on my post (it was public) to comment. Let’s focus on Rich’s interaction with me for a minute. Now I know I’m not crazy. 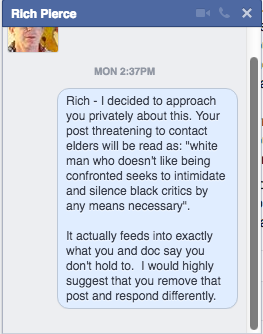 Several people hit me up privately thinking that threat to contact elders was a bit out of line. I’m thankful one friend spoke up immediately about the incident. Friend: So… Is Rich saying he’d contact the elders on you? Or am I reading that incorrectly. Tell me I am… I’m re-reading…. Me: I’ve already contacted him privately and told him that his post will get read as “white man trying to silence any criticism by intimidation” and that he should remove it. Friend: chile because that’s how I read it. that’s EXACTLY how I read it. Me: I’m really REALLY holding back. I’m even typing slow. Friend: I say just let it be.. seriously you already know the answer to this..
Last thing a white guy being accused of being racist or insensitive needs is to get perceived as racist or insensitive based on one post. What I got was blocked with all comments apparently deleted. Of course, the internet never forgets (hence, the PDF file of the initial exchange). So….of course, I mention publicly that the good Mr. Rich has deleted his posts. Apparently, I wasn’t the only one expecting a more mature response from Rich, as the responses that follow my initial post show. The post is still up – you can read it yourself from here, as none of my friends or myself have edited or deleted anything. Please make sure you note the discussion and the attempts by some of our common friends to give Rich the benefit of the doubt. One of them (as you can read) ends up blocked. As an FYI, both posts are public on FB. Google has already indexed them. Here’s the original Post on FB, beginning with me announcing that I’d been blocked. Read onward from here. Two of my friends attempt to respectfully engage Dr. White on Twitter…. again, you can read the convo and see their screen shots. A little further down, you’ll see two of my friends – Mike and Dave – try to dialogue with Dr. White on Twitter. Luke (who commented on FB) also gets blocked. The entire experience has been more than a bit disappointing. I’ve never known JRW or Rich Pierce to not engage folks in conversation or run from conversations where people have approached them respectfully and in an irenic fashion. Of course, this is where the nice BlackCalvinist steps aside and the polemical BlackCalvinist steps up. The initial issue I and others had with Dr. White’s comments were that he was completely graceless in his observations and future predictions for this boy. Ekemini and others pointed that out repeatedly. He, in effect, ignored the fact that this young teen boy was still made in the image of God and simply reduced him to a throw-away set of statistics. The fact that he continued to double-down on them and ignore/rebuff the multiple godly men who approached him privately only to argue with a female M.Div student on social media is unsettling. This is not the James White we’re all used to seeing. The James White we’re used to seeing put up a careful video blog on how to talk to Muslims in a fashion that seeks to win the soul of the individual. The James White we’re used to seeing wrote words that almost moved people to tears when he described the deep spiritual darkness he encountered every year he visited Salt Lake City to witness to Mormons. Where was all of this grace and care and hope in his description of the boy in the video ? Where was his prayer for the power of Christ to step in and change this boy’s heart from authority-hating and God-hating to God-honoring ? Where were the prayers for his mother (since he is assumed by Dr. White to probably be without a father) to help point him to godly men ? Even more disturbing (and one person posted in the comments to him on Facebook) was the Pharisee-like, rose-colored glasses description of his own time period growing up, as though the sins of littering and contempt for authority only came into existence after his childhood was complete. As a student of history and culture (it overlaps with my professional job as a music instructor), the 1962-1980 time period in the country was filled with just as much turmoil, upheaval, contempt for authority, etc…. as the present. You and I are only separated by a decade in age. What made you to differ from the unsaved masses around you, Dr. White ? Dr. White’s initial response to the first criticisms (and Rich Pierce deciding to follow along) consisted of creating an assumption based off one sentence, creating a term (racial gnosticism) and strawman attacking those who disagreed with him as violating a ‘colorblind’ interpretation of Galatians 3:28. He (wrongly) says that his opponents are choosing to define themselves first by race/ethnicity – a charge unsubstantiated by any of the blogposts of any of the individuals involved. If I didn’t see it, I’d have thought this Dave Hunt-level of argumentation came from…well…. Dave Hunt. “Whenever there is a social media post, story, or an incident involving race, as a person of color, I must do a racial cost-benefit analysis. On the cost side, I measure the psychological, emotional, and sometimes, physiological toll it would take on my well-being, depending on the magnitude of the racial event. Again, no “primacy of race” in this statement, but White makes up an accusation as he goes (this is called the straw man fallacy) and runs with it, pastes it on all of his critics and then dismisses them. No, Dr. White, you have done nothing other than attack a position you created in your head. This is academically dishonest. Rich Pierce doesn’t fare any better. On his post on my timeline, he enters the post defensive and argumentative, repeating the same fallacious application of Galatians 3:28, as if Galatians 3:28 erases ethnicity from existence or even being mentioned. He then goes on to say that anyone who defines themselves by the color of their skin is a racist (mind you, he had no problems with James defining the young boy by his skin color). Rich says he got angry because I told him what his words may be interpreted as. Yet, at least two of own friends took it the exact same way and even encouraged him to contact my elders (to be fair, one backtracked quickly when confronted with stuff he didn’t know….be quick to read and slower to speak, Jeff). My suggestion to him privately apparently had some merit! 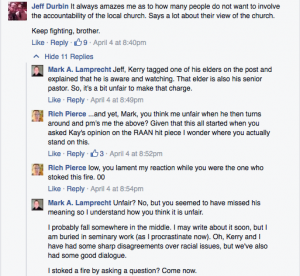 No, Mr. Pierce, you don’t get to strong-arm threaten me with possible church discipline, even though you tried to backtrack with Dale. I tagged my senior pastor immediately for multiple reasons. Top among them is that as an ordained deacon in the PCA, I have large amount of responsibility (per 1 Tim. 3 and Titus 1) before God to live with integrity. I am a LOT more careful with my words over the past three years, but rest assured – nothing to hide here and I don’t have a low view of the church, contra one or two of your posters. If you unblock or send one of your friends over to the original thread, you will also see where I tagged three additional elders from my church. If you’d like to contact any of them via telephone, contact me and I will put us all on conference call. I believe getting elders involved in this discussion may actually be beneficial. You also don’t get to be offended when I tell you that others may be offended at your tone and wording. What you should do, as an ministry leader (and probably an elder, since I saw a few sermons from you online) is simply fess up that you took things wrong or that your own tone could have been better (again, that’s what I was expecting from you, which is why I contacted you and said you may want to respond differently), especially given the fact that I and everyone else in the original post approached you as brotherly as possible. You came into the post throwing around threats and accusations. You may have missed that in the midst of being angry and defensive. You also don’t get to play the shell game with terminology. Redefining ‘racism’ to be anyone who defines themselves by their skin color is academically dishonest and poor argumentation. 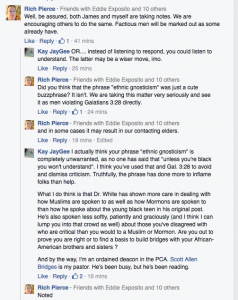 Dr. White wrote in his initial post: “In case anyone has not noticed, I am white. Scottish white. Like the Scots in the kilts charging the British at Stirling white.” By your own words then, Dr. White would be classified as a racist. See last sentence and apply it. You are out of line (and engaging in a logical fallacy) in attempting to paint anyone who acknowledges that different biological ethnicities exist as a racist. Christian love does not attribute evil motives to those in the body over a disagreement like this. Christian integrity also seeks to deal truthfully (1 Cor. 13:6) with positions it disagrees with. You and Dr. White have not dealt truthfully with those you disagree with when representing their positions. You have created imaginary “racial gnostics” and attacked them. While I will not assign white privilege or inherent racism to either man (I believe these ‘answers’ are too simplistic and ultimately not applicable in this case), I will point out a simple truth: we all have blind spots due to the noetic effects of the fall. Adam and Eve, when confronted by God in the garden, ran and hid themselves in Genesis 3. When confronted up close (seriously….where are you going to run from God ? ), Adam blame-shifted to God….”this woman YOU gave me”, as Adam ignored his own immediate blind spots – it was he who abdicated his responsibilities as husband in taking the fruit and following the lead of his wife. The Christian life is a life-length marathon to overcome those blind spots. For some of us, it’s eschatology. It’s why you can have can sit Ken Gentry, Darrell Bock and John Piper on the same stage and they come to different conclusions on the details of the end times. For others, it’s reformed theology. John MacArthur called Wesley a “confused Calvinist”, since Wesley often wrote in his journals that he did not believe he was regenerate, even though in the same journal entries he would show signs of and the fruits of a regenerate life. Dabney and Edwards wrote spectacular theological bodies of work that have been referenced again and again. Both men had a gift for taking the complex ideas of scripture and explaining it in a way that the layman could easily access. But Dabney stumbled at the imago dei when he supported the chattel slavery practices of Virginia (and in general). How’d he miss that ? Edwards went back and forth on the issue during the course of his life, dying still a slave owner (he did not free his slaves in his will). But his son became an abolitionist. The fog of blindness was starting to lift, apparently; enough to influence his son. They run like Usain Bolt from these conversations and become instantly defensive to anyone and anything that may touch their “uncomfort” zones. They’re not familiar with the issues, the people, and what appears to them to be a whole separate ‘culture and language’. They don’t know how to talk and are afraid of what to say because it may be taken wrong. So they stay silent when they should speak up or they say things which are taken wrong because of tone or bad wording. Sometimes, they do believe and follow narratives about black people that they learn from the media (conservative or other). Let me offer you some advice I picked up last past weekend (weekend of April 1). My wife and I spent this last weekend at the Weekend to Remember Conference at Skytop Lodge in the Poconos. Beautiful area – peaceful. One of the speakers – I believe it was Tim Downs – gave us an example of how familiarity breeds contempt and impatience. He said that years ago, there was a study done where some people asked for directions in a metropolitan area – initially with an obviously American accent from that area/region. Those people were treated a bit less friendly and with more impatience. Those same people went out and feigned different accents from different nationalities, again asking for directions. As the people appear to be more ‘alien and stranger’ to them, the study found that people were more patient, detailed and kind with the directions they gave. The exhortation was that husbands should be at least this patient with their wives. I think there’s application here too. You came in ready to report people to elders, throwing around terms and telling us that they aren’t just buzzwords. You wouldn’t do that if you were a missionary overseas in an African country (or an Asian country). You’d be a lot more patient, kind, and loving. Maybe it’s because I live in America and you’re already familiar (via whatever narrative you’ve been following….that’ll be tackled in the post after this one) with ‘black issues’ via all those statistics you cited, so you figured nothing else was needed. 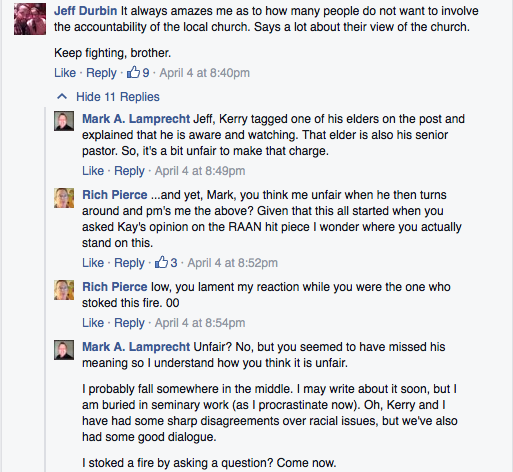 On Monday when this all took place, Rich Pierce attempted to burn a bridge over a disagreement. He and Dr. White are scared. They may hide it with anger and supposed righteous indignation, but both are scared. Anyone paying attention can see that the quality of exegetical discussion and polemical approach given by Dr. White in his responses (video and written) has been of a far lower than any of his exchanges with Muslims, Mormons and even with Jehovah’s Witness apologist, Martin Smart. While I will call you both out on what appears to be hypocrisy in your approach, actions and dealings, I will also pray for both of you to be convicted and publicly repent of your approach, your actions and attitude. I do not believe you are both ‘racists’ (some of your supporters, not so much based on their posts…). I do believe this is simply unfamiliar territory for you and you haven’t learned how to listen, empathize and communicate yet. And because it becomes so personal when we broach this topic (can’t escape the culture we live in), you’re both the skittish equivalent of startled deer. Startled deer fight back hard and they also run. So the same question I asked you in the post still stands. Instead of “listening to respond”, you could listen to understand and then respond in a brotherly fashion instead of as opponents and enemies. Are you more concerned about winning the argument or winning the brother/sister ? This is called a bridge. Walk across it instead of trying to burn it. That doesn’t mean we’ll always agree. But it means we don’t demonize each other as you’ve sought to do. The basis of reconciliation of any kind for us is the gospel. So I appeal to you both as a brother in Christ – repent, sit at the table with your brethren and have discussions with them. You will grow and so will they. We’re all using (even you) the word “race” to describe linked/related ethnic, biological and cultural differences. We know full well there’s only one ‘race’ – human. We’re using the word ‘race’ because it’s the word we’re stuck with. Ekemini pointed this out in her article on RAAN, so has Trillia Newbell in her book United: Captured by God’s Vision for Diversity. So has John Piper. There’s a lot more to write here. I’ll be addressing the topic both on video on my YouTube channel in the near future as well as on my main blog at Theologically Correct dot Com. I do have an addendum post for this that I’ll be adding shortly (it’ll be a new post) that will deal with some additional observations over the past week on this topic, especially since a few new articles (helpful ones) have come out since then. Featured Image Photo Credit: AP Photo/Pioneer Press, Brandi Jade Thomas. Cars are strewn on the collapsed portion of the Interstate 35W bridge, which stretches between Minneapolis and St. Paul, after it collapsed Wednesday, Aug. 1, 2007, into the Mississippi River during evening rush hour.